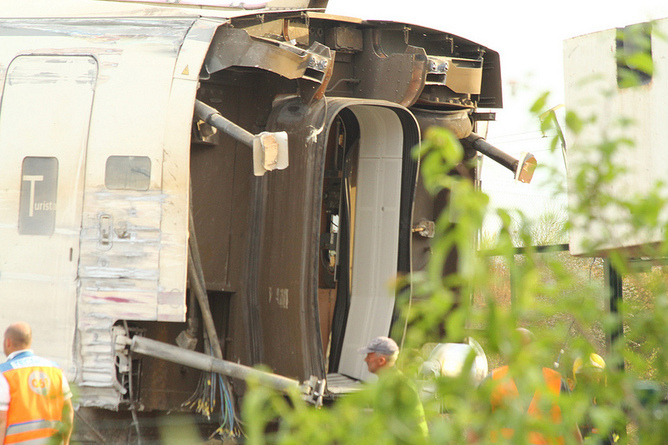 Reports from ADIF suggest that on the location where accident with the RENFE Class 130 occured on Wednesday, was not equipped with ERTMS L1 (as is the case on the rest of the High Speed Line) but only with Spain’s National signaling system ASFA Digital. The accident occured right after the tunnel in the direction of the Santiago de Compostela train station; the transition from ERTMS L1 to ASFA takes place just in the tunnel but before the curve where the train derailed. ASFA Digital does provide visual and acoustic signals to the train driver on discrete moments (when passing an ASFA balise group), who was also required to confirm the ETCS to ASFA transition, if the systems had been working correctly. ASFA does however not intervene if the speed is well above the maximum allowed speed (target speed), this intervention is by discretion of the train driver only. ASFA Digital only intervenes for speeds above 200; it is suggested that the train drove between 180 km/h and 190 km/h when it derailed in the curve. Juan Jesus Garcia Frailes of the train drivers’ union has called for more investment in safety technology on Spanish rail lines. The introduction of ERTMS across the entire country is in fact something the EU Commission had already decided on in 2005 with the aim of making cross-border train travel easier, but there is a 12-year roll-out period. The train drivers’ union announced that the tragedy “could have been avoided” if ERTMS had been installed on that stretch of track.